Disney and Lucasfilm today announced Star Wars Force Friday II, a global fan event celebrating the launch of new products inspired by the highly anticipated Star Wars: The Last Jedi. Toys, collectibles, books, apparel and more will go on sale beginning at 12:01 a.m. on September 1, 2017, with stores around the world opening for a weekend-long celebration of all things Star Wars. Star Wars fans around the globe embraced Force Friday in 2015, with hundreds of thousands turning up to stores at midnight to be the first to get their hands on merchandise from Star Wars: The Force Awakens. Toys from the new line were revealed via a global live-stream unboxing event that unfolded over 18 hours, 15 different cities and 12 countries, attracting millions of views on YouTube. Fans took to social media to share their experiences with nearly 3 billion Twitter impressions about the events, using #ForceFriday. Details of how fans can participate will be revealed closer to the event but the world-wide launch will tap new technology and Star Wars mythology to create a unique experience for fans. Just like 2015, products for The Last Jedi will be kept under wraps until Force Friday II to preserve surprises for fans. As well as introducing new characters from the movie in toy form, the line will build on the success of products like Sphero’s BB-8, introducing more innovative technology to bring the characters and stories from the film to life in unique ways. Star Wars: The Force Awakens is the highest grossing movie of all time domestically and that success was mirrored at retail. NPD reported that Star Wars was the number one toy property in the U.S. for 2016 and 2015, and that during the week of Force Friday, $1 for every $11 spent on toys was on a Star Wars item. Additionally, the popularity of the movie propelled Star Wars onto the top ten toy list for both boys and girls for the first time ever in 2015. 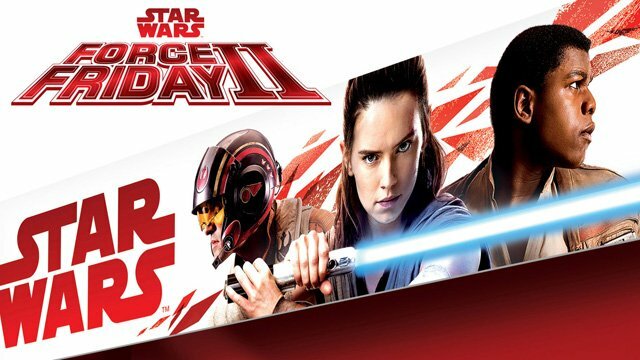 Also being revealed today is a first look at packaging for Star Wars: The Last Jedi products which feature leading heroes: Poe Dameron, Rey and Finn. The trio will be featured on Star Wars packaging beginning September 1, 2017.